"Whatever your hand finds to do, do it with all your might"
I confess I am not particularly religious, but this verse seems quite inspirational to me, today. I haven't even gotten used to having a working computer again, and I discovered scratches on the lens of our digital camera. They interfere with the shots a lot less than I would expect, and if it were just me, I'd probably just live with them; but my husband is a serious photographer, so a scratched lens just won't do for him. So, we'll be without a camera for a couple of weeks while it is getting repaired. 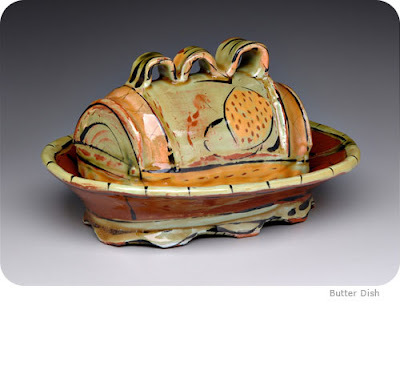 The plate and vase are by Tony Winchester, of Iowa; the jar and butter dish are Victoria Christen, of Oregan. 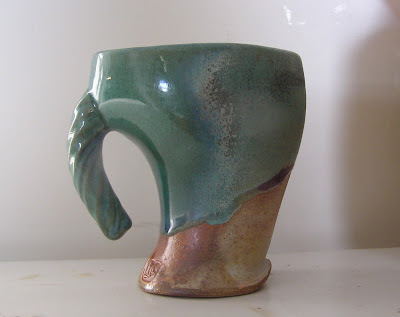 I got this glaze from the web, from a potter named Ben Owen, of Segrove, North Carolina. It's a matt green, black where thick, and when the soda hits it it becomes a brilliant, glassy turquoise. Love it. Thanks, Ben! It seems like such a ling time ago now, but I unloaded this kiln last Sunday. 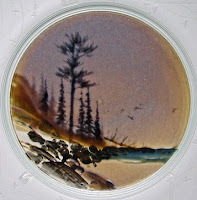 All of my new surfaces were successful, and later when I am not so lazy I will post the recipes, with examples. In the meantime, here's the overview. I used 2.5 pounds of baking soda and 2 pounds of soda ash this time. It was enough to make things juicy without getting those giant goobers dripping from the bottom of the kiln shelves, which plagued the last firng. Another change: after body reduction, I kept the flame almost neutral: just an intermittent tongue. This was because I got a lot of dark body color last time, and some steel gray where the soda was generous. I like steel gray, don't get me wrong, but I wanted some variation; and I am not crazy about the dark brown body color. The toast/suntan shades are why I love soda. So, minimal reduction on the climb. What I learned: the amount of reduction necessary for good reds is too much for good body color. The amount that gets me the yummy suntan colors is insufficient to develop good reds, at least on the outsides of things. 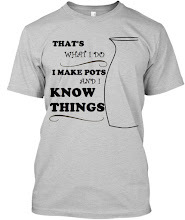 I did lose a pot. (I've never had a firing in which I didn't lose something, except back in my low-fire days.) 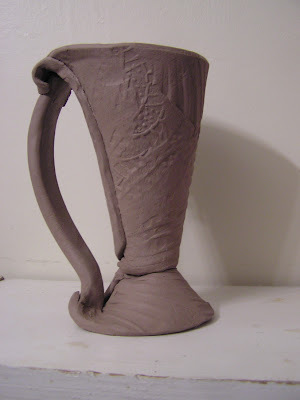 This mug fell from the shelf -- I must have knocked it with the angle iron while applying the soda mix. 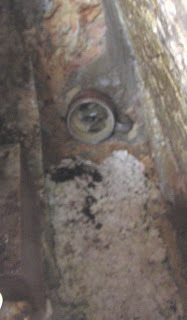 It fell into the channel and was cemented in place. Too bad, too, because look at it -- it totally would have been the fattie! The ominous noises my old iMac was making on Thursday were indeed portents: the hard drive gave up the ghost yesterday. I am at a borrowed computer for this post but I will probably be absent from my blogs for a while! (not to mention my new fling, Etsy!) I was lucky to get the warning two days in advance, as my hubby was able to back up everything we needed, so nothing was lost, except, you know, the computer. 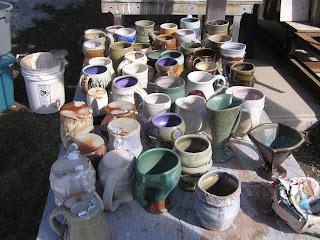 Oh, well, I really need to be glazing: more than 70 of the 100 Mugs will be in the firing that I'm loading on Thursday. 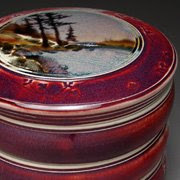 This should be a very exciting firing: I'm also using two new glazes and a new sig. 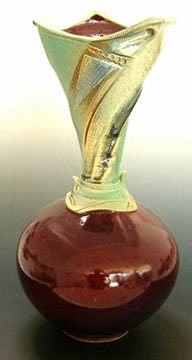 I once read a potter (forget who, sorry) who wrote that we ought to test a new glaze in every firing, and I thought, "yeah, right, like I feel like adding one more thing to the pre-firing to-do list." 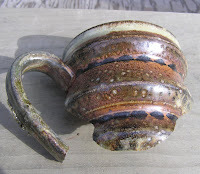 But he was right, for two reasons: 1)If you don't test glazes when you are firing, when will you do it? When you aren't firing? How's that gonna work? 2)Having an unknown factor in the firing makes it much more intriguing. 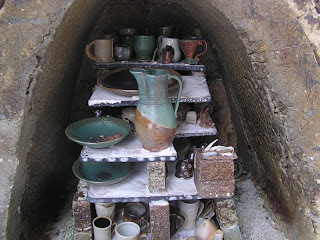 Here's a thought: if the kiln sits cool but full for longer than it needs to -- in other words, if I am not rushing to unload -- it's time to change things up. I can get a used iMac for around $80, plus a whole boatload of shipping costs. Not too bad...it'll just take a while. See you then! 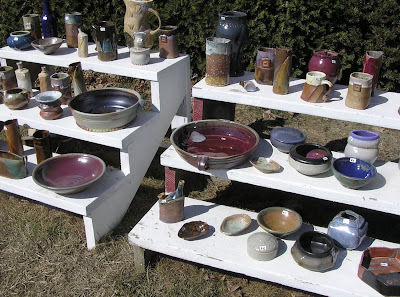 I finally felt safe today to put out the pottery stands in the front yard. Though the temps will drop below freezing this week, no precipitation is predicted, so I won't suffer the breakage that comes from having a pot full of water freeze up. I usually leave the work outside day and night once the season begins, moving it only to clean and refresh the display, and also to mow under it. Though it is out overnight, we've had surprisingly little theft and no vandalism. Occasionally we get up (or come home) to money or an IOU in the mailbox! No sales today, though. 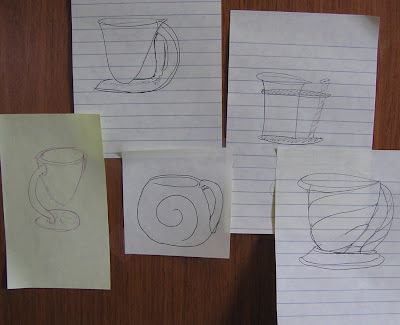 These are all seconds (but not thirds or fourths, if you know what I mean) or else pots that have been kicking around for a long time, that I am tired of looking at. 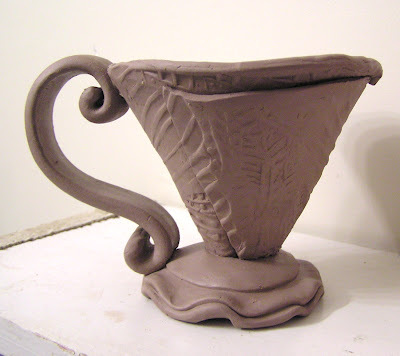 A few were pieces I made as class demos. The yard sale never generates a great lot of money, but in the summer it's a steady stream of five-dollar-bills -- enough to buy cat food when we are out, or a quart of milk so I won't have to drink ny coffee black. 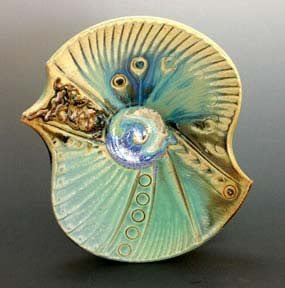 I am mixing up a new glaze and a new terra sigillata today, to test in the firing scheduled to load 3/19. Gotta have some new surfaces for those 100 mugs! 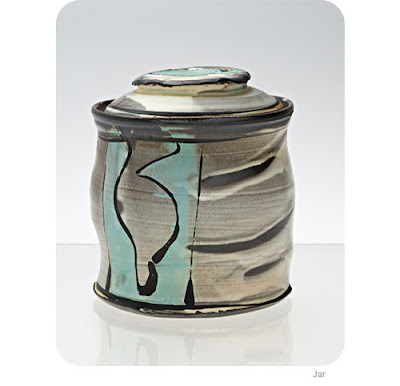 This came from Jeff Lipton, a winter resident at the Watershed Center for Ceramic Arts. Jeff suggested 14 cups of water, but that seemed too thick to me. I've always applied sig in a very thin layer. So, I almost doubled the water. I may live to regret that. No time to post: my iMac is making ominous noises. Last time a computer of mine did this, the hard drive crashed. Also my house is filthy. (I know, I know. But it is, and it's bugging me.) So I'm just posting an old photo that I found while backing up the hard drive. 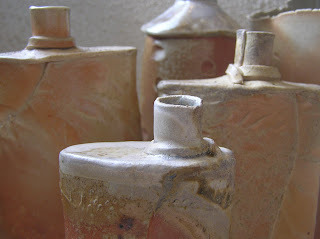 These were from Doug's first ever firing, in 2006. 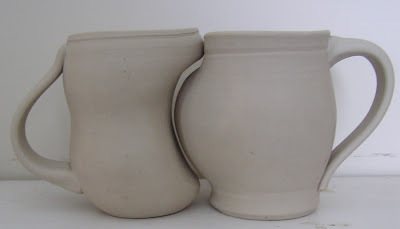 He's sort of moved on from wood firing, but I still love these pots. Remember that book, The Secret, from a couple years ago? On page 1, it promised ..."The Secret gives you anything you want: happiness, health, and wealth. ..."
A couple of my friends bought copies, and were all into it for a while. Not to spoil the ending, but the much-vaunted secret is that you walk around actually believing that what you want to happen, will happen (even better: already has happened. Try that one for making people think you are crazy.) Then the Universe, or whatever, will reward your faith by giving you what you want. Or something. "It is exactly like placing an order from a catalogue. 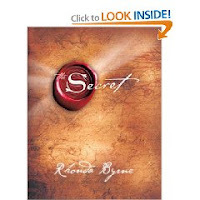 … You must know that what you want is yours the moment you ask," writes author Rhonda Byrne. It sounds as though Byrne took Yoda too seriously: "I don't believe it !" says Luke; "That is why you fail," says Yoda. It was just a movie, Rhonda. Emily Yoffe, Slate's Human Guinea Pig, wrote an entertaining article about it in 2007. My immediate reaction: what a bunch of hooey. In the first place, how can you believe what you don't believe? It is logically impossible, as belief is not a function of will. Further, given the appropriate level and form of mental illness, a person might believe all manner of nonsense. "Oh, Ebenzer thought he was Julius Ceasar; so they put him in a ho-o-ome. Rubbed his body with medicinal compounds, now he's Emperor of Rome." But Ebenezer is still a patient in a mental hospital. I could go on, as I am still convinced that The Secret is drivel; but that is not what I'm here to write about today. While you can't will yourself to believe what you don't, I am still perfectly capable of believing, against my will, things that I know to be untrue. For example, I believe that I am some kind of money repellent. Now, I have enough to eat, I own my own home, none of my bills (well, except my oil bill) are past due -- I am doing alright. However, it stands as a point of dogma that in any given business situation, I will make less than other people in the same situation. Baltimore ACC show? Never took more than $12,000 in orders, when some others were writing hundreds of thousands. Opened a retail store with other artists? My biggest month to date was around $800 in sales, while my partners made between $1200 and $4000. See what I mean? Of course, it is a chicken/egg conundrum: do I believe I can't make money because that's the way it always turns out, or does it turn out that way because that's what I believe? I was born on a Saturday, and all my childhood heard the old rhyme about "Saturday's child works hard for a living;" perhaps I am endeavoring to make it so. I swore I would not get distracted this weekend, but there are more important things than pottery, after all. My nephew, Sawyer Francis Keenan was born yesterday morning. Sawyer was a month early but all - mother, baby, and father (my kid brother!) - are doing well. At almost the same time, a friend of ours was found dead in his home, of unknown causes. He was 48. So naturally I have not been in the studio much. 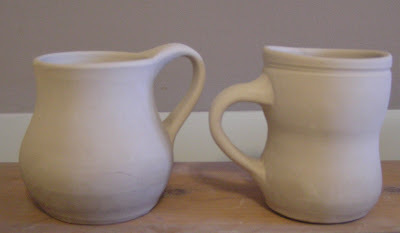 I did manage to finish the last two mugs(above). I haven't a clue what those mason stains (in a b-mix slip) will do at Cone 10, or how they will react to soda. They were just some that I'd had around the studio for years. Guess I am going to find out! I have no illusions of creating anything quite so impressive, but again, this excercise is pushing me into territories where I wouldn'nt normally stray. I have largely been successful at re-ordering my priorities so that I can spend more time in the studio; I now spend at least five hours a week more making stuff. Having a goal and a deadline really motivates me. In a hopefully unrelated development, I now find I have a constant slight pain in my lower back. This started a month or more ago; I noticed I was being very careful when I bent down to feed the cats first thing in the morning. I attributed it to my winter inertia, and figured it would clear itself when the weather improved and I became more active again. That still could be the cause, I don't know, but unfortunately it's no longer just in the morning, but all day, and it's a constant tweak threatening to turn into a sharp pain. Like a lot of artists, I don't have health insurance, so I plan to address it with some half-assed and homemade yoga and stretching, and prayer.